Maintenance of normal pressure within the eye depends on a delicate balance between production and escape of internal eye uid (aqueous humor). In glaucoma, the fluid drains too slowly or is completely blocked. As the fluid builds up, the pressure inside the eye rises to dangerous levels causing pain as well as retina and optic nerve damage. What Causes Glaucoma in Pets? Inherited, born with an abnormal drainage system of the eye. There are many breeds of dogs that are predisposed to this condition. The most commonly seen breeds with glaucoma include Arctic breeds (Samoyed and Husky), Basset Hound, Cocker Spaniel, Beagle, Chow Chow, Maltese, Sharpei & Shiba Inu. Lens disorders such as cataracts or instability of the lens. 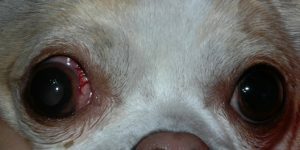 What are the Symptoms of Glaucoma in Pets? At first, there are no symptoms. As the disease progresses, vision loss and pain occurs. During your first appointment, a complete ophthalmic examination will be performed to assess the level of visual impairment and stage of glaucoma. Intraocular pressures will be taken and medical and surgical management will be discussed in detail. 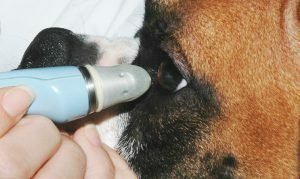 Testing for Glaucoma in a dog. Laser surgery: Surgery is reserved for patients whose pressures cannot be controlled with medications. Endocyclophotocoagulation (ECPC) is the newest technique that carries the highest success for glaucoma surgery. MedVet’s ophthalmologists were the pioneers in developing this technique in veterinary ophthalmology, and it has been performed here more than any other place in the world. Laser Surgery. Picture of limbal approach ECPC. Glaucoma surgery involves the destruction of the ciliary processes with a strong beam of light using an endoscopic tool in an attempt to reduce the uid production in the eye. 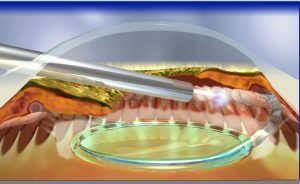 The bene ts of this procedure include direct visualization of the ciliary body, eliminating destruction of surrounding tissues. We currently have an 85% success rate of controlling intraocular pressure for at least one year. Patients are hospitalized for at least three days after surgery for close postoperative monitoring of eye pressures. Dogs are sent home with an Elizabethan collar to prevent them from rubbing the eye. At home, care involves applying eye drops several times daily for a few weeks, then slowly decreasing the frequency of medications over time. Some cases may also require oral medications. Normal activities can resume after two weeks. Complications of the surgery include anesthetic death, uncontrolled glaucoma despite surgery, hyphema (blood in the eye), retinal detachment, permanent corneal edema, in ammation, and/or infection. Your doctor will discuss any possible complications with you before and after surgery. Follow up appointments are extremely important to help maintain sight and controlled intraocular pressures. Frequency of medications will then be determined and evaluations every 3 months will be recommended for life. The most common cause of glaucoma is inherited disease. is a 50% chance that the other eye will develop glaucoma within one year. The other eye should be closely monitored by an ophthalmologist. There is no cure for glaucoma, only control of the disease with further treatment. Medication for glaucoma is lifelong. Permanent blindness may occur WITHIN HOURS if increased intraocular pressure is maintained. If you suspect your pet is experiencing high pressure, please contact us or our emergency department immediately. Glaucoma surgery may prolong intraocular pressure control and sight.